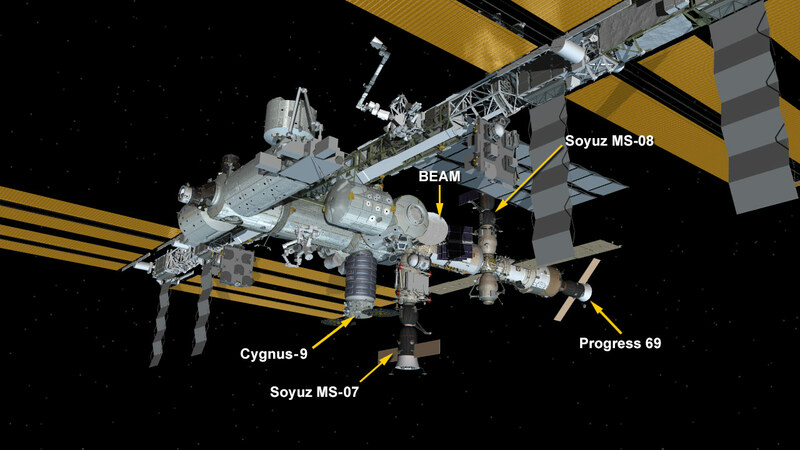 The Orbital ATK Cygnus cargo ship was bolted into place on the International Space Station’s Earth-facing port of the Unity module at 8:13 a.m. EDT. The spacecraft will spend about seven weeks attached to the space station before departing in July. After it leaves the station, the uncrewed spacecraft will deploy several CubeSats before its fiery re-entry into Earth’s atmosphere as it disposes of several tons of trash. We need some ice for the 2018 Memorial Day holiday, please don’t forget to bring back some ice. I am proud of you astronauts and pleased too, congratulations on your steady work, I’m praying for you too. I have been watching for the iss from Michigan, USA. I tell people about you. Why is there no mention about sextant on Cygnus at information above? Was it “fake news”? Thanks a lot Mark (and payload investigator) for positive answer. I’m looking forward to the results of that experiment eagerly. New Horizons in The Quantum Fields. This is in the references to your post at 17 may 2018 in respect to The Coolest Spot in the Universe Laser and Magnetic traps Slaw atoms down until they are almost motionless. I would kindly to draw you attention for a several points of the experiment of The Cold Atom Laboratory (CAL) for a multi-user facility designed to study ultra-cold quantum gases in the microgravity environment of the International Space Station (ISS). 1- The Atomic Gravity Fields will be activate [ Where on Earth`s Gravity Field all The Gravity Fields of all material objects been cancel due to the combination with The Gravity Fields to compose the total Gravity field of The Earth ], therefore During Inside CAL ULTRA-COLD ATOMS and in the zero gravity while atoms hold their wave like forms as a Freefall The Atoms of the experiment will attract with each other the same way of the attraction of a small material on the earth as a Van der Waals force. Remember The Light Diffraction Phenomenon occurs even on Earth`s Gravity zone, while it depends on The Atomic Gravity Fields when light passes a nearby these Materials which have the influences to bend the path of Photons of The Electromagnetic waves. 2- In order to understand The quantum phenomena’s it is strongly recommended to measure practically in The Physics Labs to recognize The Value of The Magnetic Field Force of The Electron and also for The Positron and the depth of their Active Magnetic Fields in The Spaces around them, because the effects of these a Magnetic Forces determining The Size of Atoms and their Chemical and Physical Characteristics, While these Characteristics differs of each other due to the different of a value of the total active Magnetic Fields either of The Electron or The Positron, either the Attraction Force between Electron and The Protons of The Nucleus of atoms or The Repulsion Forces among The Electron While they form Electrons Orbit of The Atoms and also The Attraction Force between Electrons in The Atomic Orbits With The Protons While Positrons Grant their Magnetic Fields Characteristics to The Protons of The Nucleus of Atoms (Which represent The Nuclear Magnetic Resonance). The a different Values of the Attraction and Repulsion that may be different among atoms of The Atomic Table changing The Size of Atoms and their Chemical and Physical Characteristics. Therefore determining these values may help us to better understand Quantum and to produce Materials with a specific Characteristics required to our application. It is a great experiment and may open a new horizons in the Quantum fields. Important Note: The recent planned experiments which should be done on The Board of The International Space Station The Cold Atom Laboratory (CAL) should be achieved a several times at a different values of Temperature, because at a very low values of Temperature The Nuclear Magnetic Resonance will occur which may also have The Influences upon the atoms of The Expirment Materials as a Repulsion Force among these Materials, therefore the case of this expirment is variable due to the value of the Atomic Gravity Fields ( Attraction Force Among These Materials) which may appear obviously at The Zero Gravity Environment and The Nuclear Magnetic Resonance which may push these Materials away of each other. is a good model? We are nowhere close to going far beyond the umbilical of Earth. Tons? Each disposable craft? No way can such economy sustain a mission to Mars. I am in full support of all space efforts, but with such waste, we are not ready, unless the recycle loop is closed. It seems not, yet. But, we learn much, must learn more, and if we over reach, could doom our goals by failure. Can’t waste in space.